Jessica awoke to the tantalizing aroma of chocolate. She rolled over and looked at the clock. “Mom’s making chocolate cake at six o’clock in the ?? Awesome! !” She threw on a t-shirt and a pair of jeans and dashed down two flights of stairs to investigate, convinced that Mom must have gone off the deep end. However, if making cake for breakfast was the result of a deranged mind, she was all for her mother being wacko. She’d willingly put up with Mom’s chemistry-experiments-gone-wrong and the occasional mother-initiated Noah’s flood in the kitchen if the flip side was having her favorite dessert before eating her vegetables. I woke up to the sound of her footsteps pounding on the stairs. I heard a sharp intake of breath and then a scream. “MOM!! !” Had she fallen? Was she hurt? I dashed to the top of the stairs, fearing the worst. I looked over the railing. There in the middle of the beautiful pale blue Chinese rug at the bottom of the stairs was Guinevere. She had a can of Ghirardelli cocoa by the throat and was trying to break its neck, shaking and spinning around like a centrifuge. An eight-foot circle of cocoa powder was evidence of her heroic efforts to protect the family from this monster. 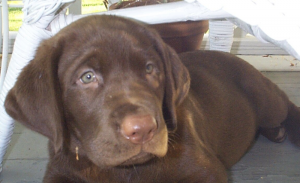 She was a chocolate Labrador, and like attracts like. We never expected Guinevere to survive puppyhood. She tested everything for edibility. On a walk she did four times as much sniffing as she did walking. Her idea of vigorous exercise was fetching the Kong and immediately lying down with it, holding it in her mouth like Winston Churchill’s ever-present cigar. We theorized that she had been traumatized in the litter, pushed away from her mama’s teats by the other puppies. Hence her obsession with food. She got into everything. One lovely summer morning I stepped outside to admire my irises at the height of their bloom. Every single flower head had vanished. Empty bread bags kept company with the remains of chocolate bar wrappers on the pantry floor. One day, Guinevere coughed up an entire Haagen Daz lid. At the time they were made entirely of plastic. How was it possible? I thought of a line from an old song: “She just opened her throat and swallowed a goat.” On another occasion, an entire avocado disappeared, including the thick leathery skin and rock-hard pit. The only evidence remaining was a teaspoonful of hard bits the size of peppercorns. Keeping food at the back of the counter or in the middle of our extra-wide center island or on a high pantry shelf was not effective. How a chunky, seventy-nine-pound dog with a bum hind leg could reach those alpine heights remains an unsolved mystery. We needed to find a place that defeated her prodigious mountaineering skills. Something the equivalent of Mount Everest. Aha! The top of the refrigerator! A new verb was born: to Guinevate, which meant to place something in an impossibly high spot, where even the lady of the house had to climb on a high stool to reach it. There’s no way for paws and claws to gain purchase on the slick side of a refrigerator. Guinevere lived fifteen years and four months, the equivalent of 107 human years — off the charts for a Labrador. From Guinevere I learned four important lessons. Eat whatever you want, even if the experts say it will kill you. It won’t. Being fat is okay. You don’t have to be skinny to live a long life. You’ll get plenty of exercise just reaching for your food. Image is overrated. What do you care what other canines think! I sure wish Guenivere were here to teach me a few things. Compared to her I am a rooky. I only have a zipper, two rugs, and a slipper to my credit at the moment. But I am only 5 months old. Thanks for sharing. I will do my best to equal her record. Hi,you mention three things Guenivere taught you but list four…. Thank you for catching the inconsistency! How fun! Sounds like she kept you on your toes! Thank you for such a wonderful true story. I’d best not worry about my teef. They have a long way to go to catch up with Guenivere, but I am not two yet so I guess I have time to work on this.